Simply get away from it all at our wonderful spa. 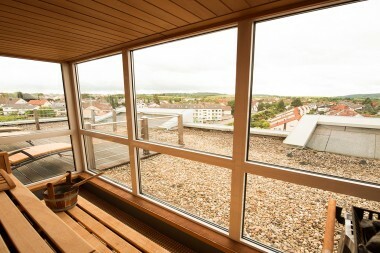 Besides our indoor sanarium, our rooftop panorama sauna offers you a breathtaking view of the mountain vineyards and the Kraichgau region. The resting room is stylishly painted in pleasant latte brown tones. Comfortable daybeds beckon to you to lie down and relax, the shower area beams in bright orange and apricot colors. A multifunctional shower refreshes you after a hot sauna. We recommend finishing off a hard day of work by watching the sunset on our rooftop terrace. Open daily 17:30 to 22:00.